Wendals dog conditioner will stimulate the appetite of dogs, and will help to optimise the nutrient value of the diet, resulting in weight gain and an improvement in condition. 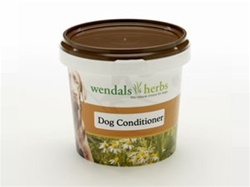 Ideal for younger dogs or dogs recovering from illness. Contains: Basil, Celery Seed, Dandelion, Fenugreek Seed, Garlic, Golden Rod, Sage and Seaweed.